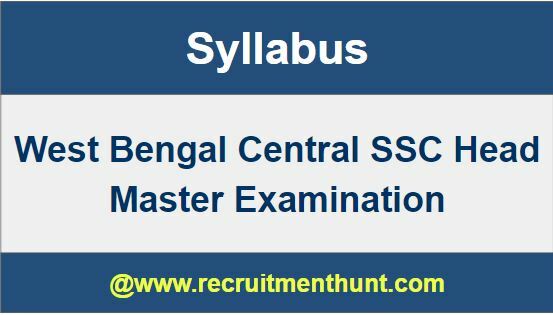 West Bengal Central SSC Headmaster Syllabus: Searching for West Bengal CSSC Headmaster Syllabus PDF? Then, don’t worry. You are at the exact place. Here all the interested candidates can get the complete and detailed West Bengal Central School Service Commission (WBCSSC) Headmaster Syllabus along with the complete and the latest West Bengal CSSC Headmaster Exam Pattern. Hence, the candidates can now check and download the complete, lastest and detailed West Bengal CSSSC Headmaster Syllabus & the WBCSSC Exam Pattern from this website. So, the candidates who are willing to attend the exam can check the West Bengal SSC Syllabus. Not only the WBSSC Head Master Syllabus but also the candidates can check the WBSSC Exam Pattern. So, the interested candidates can also check the WBSSC Head Mistress Syllabus. For more information regarding West Bengal central SSC Headmaster Examination, you can subscribe to our site www.recruitmenthunt.com for more updates. West Bengal School Service Commission (WBSSC) is going to conduct 1st State Level Selection Test (SLST) for recruiting qualified and skillful candidates to the posts of the Headmaster/ Headmistress in Secondary and Higher Secondary Schools of West Bengal. According to the West Bengal School Service Commission Latest Notification 2019, there are overall 1749 Vacancies. Therefore, all the interested and eligible aspirants who wish to build their career in the Teaching Profession can apply for this West Bengal School Service Commission Headmaster Recruitment 2019 through Online before 27th June 2019. After successful submission of application, the applicants must download all the West Bengal School Service Commission Headmaster/ Headmistress Syllabus & Exam Pattern which is provided below for the exam preparation. The West Bengal SSC Headmaster Syllabus & Exam Pattern is now made available here to download for all the aspiring candidates. So, the aspirants who are preparing for West Bengal State Level Selection Exam 2019 can check the West Bengal School Service Commission Syllabus & the Exam Pattern for Headmaster/ Headmistress Posts on this page. With the help of the WBSSC 2019 Syllabus, the candidates can know the important topics asked in the examination. If they prepare all those topics, then all the individuals can score good marks in the WBSSC Headmaster Exam 2019 and also crack the WBSSC Vacancy 2019. All the aspiring candidates must visit our website Recruitment Hunt daily to get more latest updates regarding all Government Jobs, Syllabus, Previous Year Question Papers, etc. The WBSSC Exam Paper is divided into four parts and there will be 15 multiple choice questions from each section. One mark for each question is allotted. The whole paper is comprised of 60 marks. The time duration allowed for the written test is 1 Hour. The entire topic wise West Bengal SSC Headmaster Syllabus 2019 has been provided below. Five Issues Related to International Level. Five Issues Related to National Level. The Five issues related to State Level. Safety of Children in School & Protection of Child rights. Management of Quality of Learning. Supervision and Support at the School Level for Monitoring of Quality. Some Acts and Rules in West Bengal regarding Management of School. Finally, all the candidates can get the detailed West Bengal SSC Headmistress/ Headmaster Syllabus & Exam Pattern has been updated here. Hence, the candidates can download WBSSC Headmaster Syllabus & Exam Pattern in PDF format from the link given above. For any further information regarding WBSSC Jobs, visit West Bengal School Service Commission Official Website www.westbengalssc.com. All the aspiring candidates must visit our website Recruitment Hunt daily to get more latest updates regarding all Government Jobs, Syllabus, Previous Year Question Papers, etc. I have joined my service on26.10.2007and I sit for h. M. Exam and qualifying written exam. Can you tell me if I will qualify for personality test. At the time of application ten years was not completed but now at the time of exam I have completed 10years.